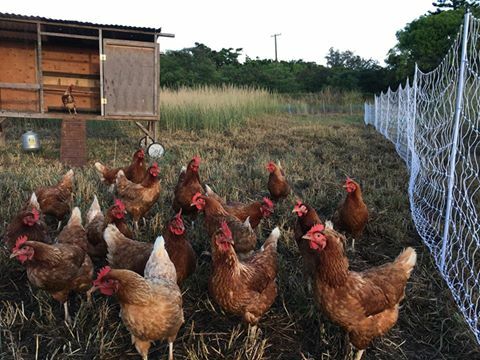 'i'o Farm, in Haleiwa, using a Slow Money Hawaii loan, supplies pasture-raised chicken and rabbit to the North Shore community. Hawai'i has very little locally sourced small livestock meat. Small farm and food entrepreneurs have difficulty accessing affordable capital to grow their businesses – loans from typical institutional lenders are either too expensive or have stringent requirements beyond what a small or start-up farmer can meet. Banks are not particularly sympathetic to the variables that are an accepted part of farming. The borrower's character and community benefit don't score extra points on typical loan applications. We frequently hear that up to 90% of our food in Hawaii is imported, along with reminders of how vulnerable we are to air and sea port closures in the event of a hurricane, tsunami or strong earthquake. Health threats caused by disease-tainted food imports are in the news too often. We've also learned that industrial agriculture is one of the biggest contributors to global warming. The time is ripe to take more control over our food. Farmer Zac of Living Aquaponics used a Slow Money loan to expand his aquaponics training business to students from around the world . We bring Hawaii farmers and food entrepreneurs together with members of their community who appreciate safe, clean, locally grown food and are interested in lending their financial support via a small loan. Slow Money offers opportunities for farmers and prospective lenders to get to know one another, resulting in the facilitation of short-term low-interest loans help these businesses expand. We also endorse some borrowers on KIVA, a global online lending platform, and help them raise loan funds there. Curious about how a Slow Money investment works? Would you like to know more about becoming a lender? The Aina Fund offers foundations and philanthropists a means to support small sustainable agriculture through donations.